13/11/11 - Restoration - Versailles, Château - Let us begin in a positive way. 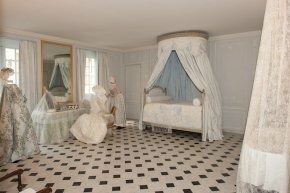 Marie-Antoinette’s bathroom (La Pièce des Bains de Marie-Antoinette), located on the ground floor, at the left as you enter the vestibule from the marble courtyard, had been restored in 1984. Strangely enough, this restoration had not been completely finished. 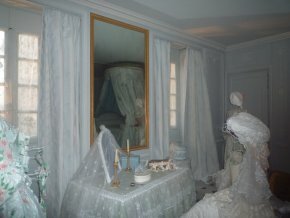 The frames on the mirrors, notably, had not been gilded. This has now been done wheareas the wood panelling designed by Mique and sculpted by the Rousseau brothers has been cleaned. This is a light restoration but it has served its purpose in refreshing the look of the room which has also been furnished in order to "evoke" a late 18th century bathroom. As the original furniture had disappeared, equivalent pieces were chosen, duly justified on condition that fake articles are not manufactured on purpose as had been the case for the antechamber of the "Grand Couvert" (see news item of 20/10/10). Regardless. We might have been spared the "staging", based "on an idea by Hubert Givenchy" (is this supposed to be a Hallmark theater production for television ? ), with paper costumes and fabrics by Isabelle de Borchgrave. True, the latter is very talented and the effect is indeed charming. There is not a single inch of real fabric in the room, even the bed canopy is made of paper. One would never guess. This temporary exhibition is supposed to last only one year, unless public demand requires an extension (alas, this may be the case) in which instance we fear it might become permanent. We have already seen the fake grille, the fake furniture... We will inevitably, no matter how much Béatrix Saule may protest to the contrary, find ourselves looking at fake wax figures. The current setting is not far from it. We do hope, as she states, that this is a once-only occurrence. The project was funded by the European friends of Versailles, an association recently created under the sponsorship of the Amis de Versailles, and it is their first operation. It seems that the French taxpayer will not be affected by the ensuing fiscal deduction. We have also been told - an age-old argument - that one goes with the other and that a simple restoration could not have taken place unless accompanied by this "stage setting". Curious friends indeed who, when visiting an ailing person without resources, offer to powder his nose when what he really needs is an actual treatment. We can easily imagine ten more useful ways to employ the budget spent for this presentation (we were not able to determine the price of the presentation out of the total expenditure of 190,000€ for the project). In short, we are happy to see that this restoration took place but regret the often systematic way in which a serious project is then treated in a spectacular manner. The public will no doubt love it !